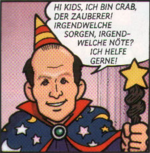 Crab is a human wizard who appears in the Club Nintendo comic "Super Mario: Mario im Wunderland". He is able to change the appearance of other characters using his magic wand and appears as a very friendly and helpful man. However, Crab does not seem to be able to use his skills reasonably, turning Kirby into a toaster, for example (what Kirby wanted was to turn into Mega Man, or at least look similar to him). The wizard lives in a castle somewhere in Wunderland.